In the past I’ve procured fresh aloe leaves, filleted, and scraped out the gel for use in smoothies. As it turns out this aloe vera gel is much easier to work with. For these reasons aloe vera in a bonafide superfood. The aloe and citrus fruit in this recipe stimulate and facilitate the elimination of toxins, hence the detox smoothie categorization. You can’t go wrong with a nutritious and delicious smoothie that also helps you do a little detoxing. The picture of this smoothie didn’t turn out that well, nor does it convey the almost florescent green color. Anyways, hope you enjoy! Place all the ingredients into your high-speed blender and blend for around 30-45 seconds or until nice and smooth. If you add coconut oil and don’t have a very powerful blender you might want to blend everything except the coconut oil first, then drizzle it on and blend for another 5-10 seconds to avoid clumping. I purchased the aloe vera gel from Mountain Rose Herbs. Here’s a fantastic Key Lime Whipped Coconut Oil Body Butter Recipe for those interested. I’d love to know if you try this aloe vera lemonade smoothie – please leave a comment below. Happy Blending! Hi Ryan, Just tried your Aloe Vera Lemonade Smoothie, refreshing, bitter, cleansing. Loved it – thankyou for your recipes. I have 2 a day now but intend on being a 3 shakes a day gal. Refreshing, bitter, cleansing…love your description of this smoothie :) Great to hear you’re enjoying the smoothies recipes. Keep up the good work. Im in love with Aloe Vera and us products on daily routine, including at my work place at my beauty clinic. 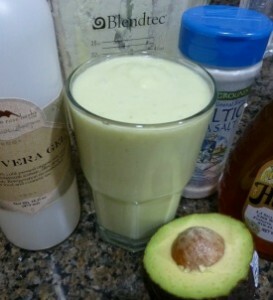 Tommorow I am going to do a talk on aloe vera and decided to do this smoothie to share with participants. Anxious to try your smoothie recipes! I am trying this smoothie this morning. I hope you enjoy it, Bettye! I didn’t like it at first but It was delicious after I blended in some ice. I didn’t have the Celtic Sea Salt, so I used Himalaya Sea Salt. My add-on was spinach. This will definitely be in the rotation. Thank you. I’ll have to add ice as an optional ingredient. Himalayan salt was the perfect substitute and spinach a nice add-on. Nice to hear this will be in your rotation. I tired this one just – but used coconut kefir instead of water-was very refreshing!! You’re welcome, Jacqueline! Coconut kefir was an excellent substitute for water. all your recipes are awesome u can add something new everytime. Thanks, Marie. Yes, being creative with your smoothies is fun stuff.